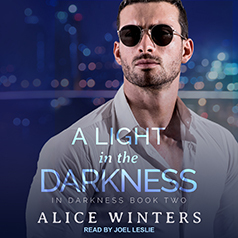 Alice Winters presents the second book in the In Darkness series. Felix and Lane are trying out their new normal. Normal means no more car chases, no more drug lords, and definitely no more kidnapping bad guys. All of that is a thing of the past in this new, normal(ish) life style filled with family get-togethers, torturous jogs through the park, and the occasional romp in the parking lot. Felix is done stealing (all but for the cat). He is actually enjoying the boring side of life, especially with Lane by his side doing what he does best: looking handsome. But when Felix's brother wants to repair their relationship, he brings with him a secret that could cost all of them their lives. Lane isn't complaining because the thrills of life-threatening situations are right up his alley. They may think they have a handle on the situation, but what they do not know is that someone has been working them from the shadows. Forcing them to do exactly what he wants as he drives them closer to his sick game of life and death. Join Felix and Lane in a race against time, their only weapons being their humor and their wit.